For agricultural labourers in rural Kent, there was a long period of poverty and political change following the Napoleonic Wars. After 1815 the government reacted to the post-war depression with repressive policies, which resulted in direct action by the population affected. The relatively high rents and low wages paid to agricultural labourers contributed to poverty and social disaffection. Many of the labourers were laid off during the winter months so they were very dependent on good wages during the harvest period. The introduction of steam-powered threshing machines severely threatened this employment and this resulted in arson attacks, machine breaking and wage riots. The Swing Riots, which took place in 1830 and 1831 were named after the signature “Captain Swing” which was attached to threatening letters sent to farmers and landowners. 4 Kentish men were executed as a result of the riots, 48 imprisoned and 52 transported to Australia . Richard Dixon, a 35-year-old father of four, was charged with having “Wilfully, maliciously and feloniously set fire to a certain barn the property of Henry Pilkington at Eastry on 15th November 1831”. Apparently Dixon had been on the parish for some time and was employed on highway maintenance. His case came up at the Kent Winter Assize at Maidstone on 6th December. During the arson case against Dixon the magistrates were informed that a witness had heard him say “If any man was taken up about it, he would be the first to stop the horse, he had been starving long enough, and he was determined to bear it no longer”. Another witness said that the previous Saturday, Dixon had been talking to him about the fires, and he pointing at Parsonage Farm said “Would be a nice to poke a brand in. it was very handy to slip out of the house across the road and back again, and nobody would know anything about it”. There had been threshing going on in the barn the night before the fire, and according to the farmer, the building had been left in a safe condition. The prisoner was called for his own defence. Dixon stated that he was entirely innocent of the allegations made against him. However, the jury returned a guilty verdict after an eight-minute deliberation. On 18th December, a warrant for his execution was received by the Governor of Maidstone Gaol, stating that it would take place the following Thursday, 22nd December. A report in the Kentish Gazette stated that Dixon had not made any confession of guilt, although the evidence provided at the trial left no doubt in the jury’s mind that Dixon was guilty. Apparently two other prisoners convicted of machine braking came forward and under oath gave statements. One prisoner, Thomas Golder, stated he heard Dixon talking to another prisoner about the fire saying “His neighbour, Deverson, had swung him and nobody saw him do it, for the way was to go by yourself because they could not trust one another”. The execution took place at the County Gaol on the morning of the 22nd December. and was witnessed by an immense crowd, many of whom were women. When the usual services had been completed Dixon climbed the scaffold, the bolt was drawn, and he was launched into eternity. 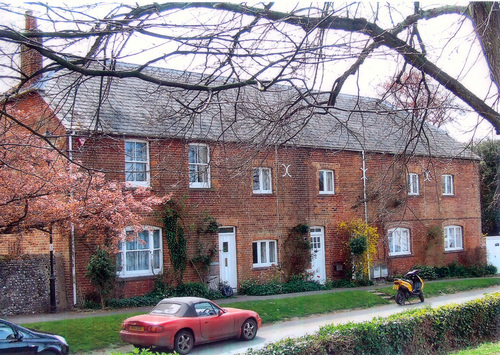 The locations of the barns in the Eastry Parsonage Farm, which were burnt on 15th November 1831, were formerly believed to be at the site of the Aumbry Cottages in Church Street adjacent to the Church Wall. We now have evidence that the original barns were located in the Eastry Parsonage Farm Yard next to the boundary of a garden, let to the Vicarage at the time of the fire, adjacent to Brook Street (Road to Deal). This garden is now the site of the New Vicarage, built in 1981. The location of the barns in the Eastry Parsonage Farm Yard, which were burnt down in 1831, have been determined with the aid of surveyor’s maps dated 1830 and 1831. 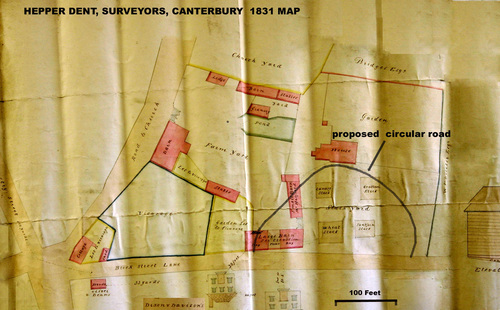 The “Plan of the Farm Yard and buildings of Eastry Parsonage”, prepared by Dent Hepper, Surveyor, Canterbury and dated 1830 [4} is shown in Figure 1. There is a barn with dimensions 23.9 feet x 94.8 feet, on the bank next to the "Road to Deal" on the map (now called Brook Street) grouped with a smaller barn , and a Hen House. There is also a faint penciled outline of a barn next to the Church Wall in Church Street on the original map, which is the present location of the Aumbry Cottages. Two large barns, three cornstacks, a gratten stack, a hen shed and all; I have made a clean sweep". This is consistent with the presence of the wooden barns etc. shown in Figure 1, adjacent to the "Road to Deal" which were destroyed during the fire. At the top of the barn, immediately under the eaves, there was an opening caused by a plank being left out when the barn was being repaired. The hole was about 6 feet from the ground. At the time of the fire the barn contained a quantity of corn in the straw. About 5 o'clock in the morning of the 14th November he was alarmed by the cry of "Fire" and immediately went down into the farmyard and found the whole of the roof of the barn in flames. The fire afterwards communicated to several wheat stacks and entirely consumed the whole. The above statement explains how the fire was started using a fire brand poked through the hole in the barn. Another plan of the Eastry Parsonage Farm, dated 1831, produced by the same surveyor, was most probably associated with the court case and is shown in Figure 2. The map has been scaled so that it has the same dimensions and orientation as map in Figure 1. I this day visited with Mr Lake the Eastry Parsonage Farm House and Buildings. It was proposed by the tenants to rebuild two barns, which had been destroyed by fire, in the corner at which the Church Road extremity of the ground meets the Churchyard line. The alteration was manifestly for the improvement of the Estate, the comfort of the Vicar and the convenience of the occupier of the Rectory. A sweeping road to the Rectory House was approved but the leveling of the ground within the proposed circular road declared to be injurious and consequently disallowed. Signed by I. Aussell. Careful inspection of the original map showed there is a penciled outline for the proposed circular road, which was never built. In figure 2 the proposed position of the road is clearly outlined. The measured distance between a house in Brook Street and the large Parsonage barn is 36 feet the names Davison (should be Deverson) and Dixon are associated with the house on the opposite side of Brook Street to the Parsonage Farm Barn. This measurement was probably used to determine how the arson attack on the barns was carried out. On the right hand side of the map the diagram of a wooden barn corresponds to the large barn adjacent to Brook Street. 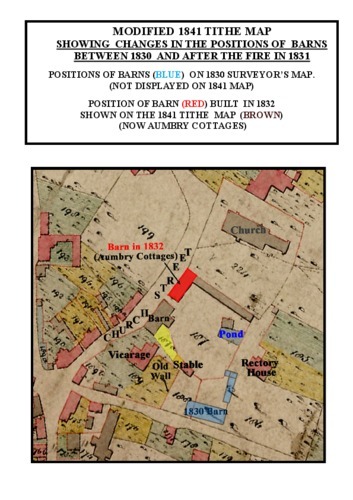 The evidence provided by these maps shows that the original barns burnt down in 1831 were in the grounds of Eastry Parsonage Farm and located next to the boundary wall of the ground rented to the Vicarage, adjacent to Brook Street. 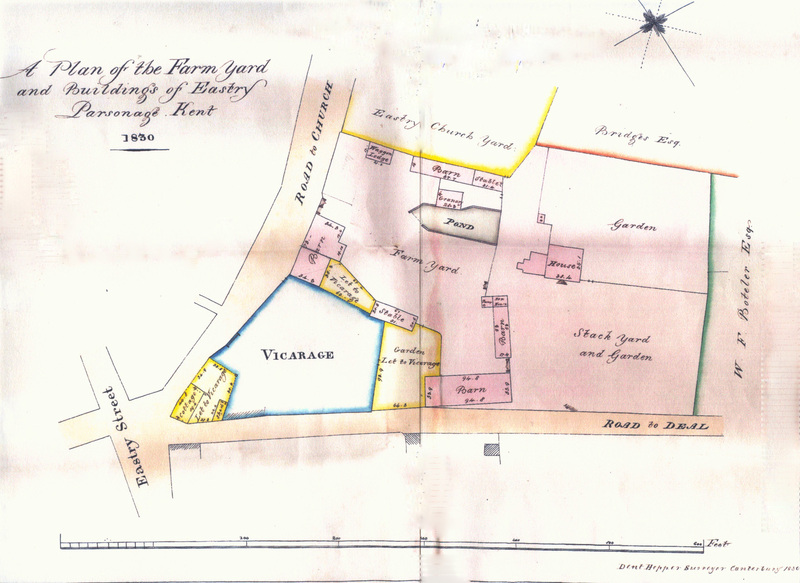 The diagram in Figure 3 is based on the Eastry Tithe Map of 1841 and shows how the barns were repositioned in 1832 after the fire. The position of the present Church Hall is also shown on this diagram'. 3 :(a) Reports in the Kentish Gazette, 25th November, 23rd December 1831. 3: (b) Morning Post, London, 26th December 1831 (British Newspaper Archive). NB Dixon's name was incorrectly given as Robert- it should be Richard. Michael Kinns and Douglas Welby researched the data presented in this article. Following an archaeological excavation in March 2013 by Eastry Local Interests Group (ELIG) an investigation was undertaken to discover which barns were destroyed by the 1831 fire. We are very grateful to Kathleen Hollingsbee who provide detailed information about the court case recorded in the Kentish Gazette in 1831 and Dixon family records.